A stunning theatrical classic that captures the spirit and tension of a Broadway audition. Exploring the lives and poignant ambitions of professional chorus dancers; those overly dedicated, underpaid, highly trained performers. A Chorus Line takes the audience through the final grueling audition for a new Broadway musical. The show features one powerhouse number after another including “What I Did for Love,” “One,” “I Can Do That,” “At the Ballet,” “The Music and the Mirror,” and “I Hope I Get It.” Song, dance, and compellingly authentic drama are fused brilliantly in this nine time Tony Award winner. 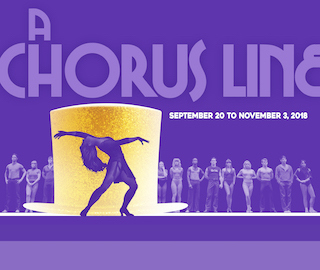 A Chorus Line captivates heartstrings until the final casting choices are made and the question of why we do anything of value is answered: for love.